A few days ago, I was challenged to create a nail art design that mimics a fashion trend. The challenge came from a nail art contest that megastyleph organized. I actually posted about it here. I really liked how the detachable collar made the outfit look more interesting and the black and white theme was personally appealing to me. When I saw this photo, I immediately knew I was going to enjoy creating this nail design. For the base color, I used 1 coat of China Glaze Moonlight and layered it with a white shimmered polish from Lucidarling. I added the latter because I wanted to add texture to the nail design and the shimmers looked fantastic. Too bad my photos wasn't able to capture it well. I used black acrylic paint and a detailing nail art brush for the collar and Sally Hansen Blackout for the nail tips. 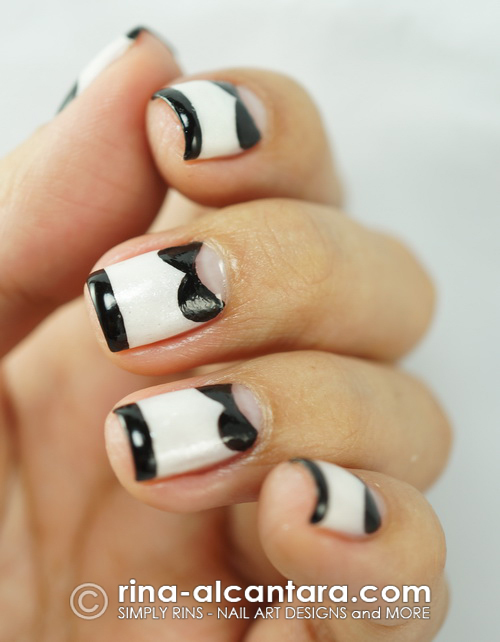 You may also use a striping nail art brush for creating the black french tip if you are more comfortable with that. If you are working with shorter nails like mine, make sure you paint the tips thinly so that you'll have enough space to paint the collars and to have a more balanced look. This is a freehand or hand painted design that I could recommend to nail art beginners because I truly believe it is easy to do, even with your non-dominant hand. The only downside I had with this design is I thought it made my nails look shorter. Perhaps the nail tips were responsible for that. But adding the thin black tip was worth it because it made the nails look more fab. There are a lot of good things about this design. First, I think it's classy. Second, it is very versatile in terms of color. I would probably maintain a white base and just change the color or the tip and collar to match an outfit. Third, you can add a personal touch to it. On top of my head is adding a bead or a rhinestone at the center of the collar for accent. A half pearl bead would probably look great. Disclosure: I submitted this nail design to megastyleph as an entry to their nail art contest. Voting is currently ongoing here. There will be 2 winners and each will get a chance to have a full tutorial feature of the nail design submitted in Mega magazine and will receive a gift certificate from Beauty and Butter. These are lovely,,,,love them!!!! And thanks for putting up the video before the begging began.....am still waiting the the vid for the flowers on OPI did on em!!!! so cute all of them =) thankss.. 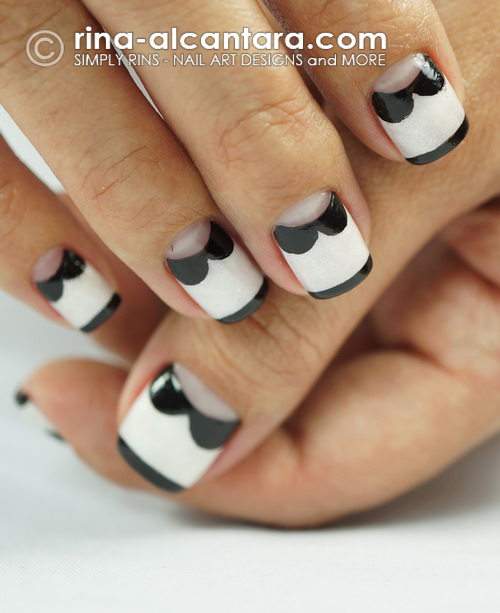 These are some of the cutest nails I've seen in a very long time--these nails are the very definition of "inspired"! This is really cute and classy!